The renowned painter Mu Jiashan was awarded the fourth time from the Chinese Ministry of Education “ChunHui plan”, started his 23 day-long lecturing tour on October 16 to Beijing University, Art design college of Tsinghua University, Art college of Xiamen University, Jiageng institute, Art Institute of Nanjing University, Digital art college of Shanghai University. 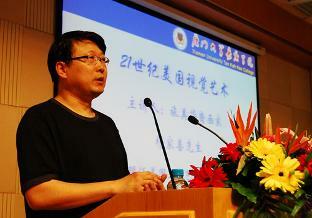 This is the fourth time this year Mu Jiashan was invited to return to homeland for lectures. From March until now, in the short 8 months, Mu Jiashan is hired by five universities as visiting professor (including Art college of Xiamen University, Jiageng institute, Art Institute of Nanjing University, Digital art college of Shanghai University and Theater academy of Shanghai). He became a well-known artisit in many Universities in China. Here we present to the readers some extracts from the lecture given at Xiamen University. 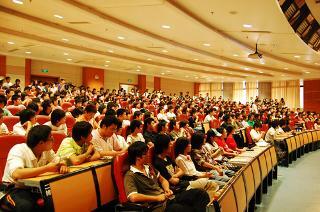 In the afternoon on October 25, 2007, the lecture hall of Xiamen University was a full house, even the corridor place was crammed full with students. This is because the seventh Jiageng lecture will be hold, and the lecturer is the president of Asian Pacific Art institute, Professor Mu Jiashan entitled” the 20th century US vision art”. In the course, Professor Mu also shared some of his own experience and feelings. He said “you must look attentively to be able to see the essence.” He repeatedly mentioned two heads in the lecture. As the artist, this “two heads” namely “a real head”, another is “your pair of hand”. The humor manifested the view which Professor Mu had. Refers to the university, he has also explained his viewpoint: The university is not a simple study process, but is an understanding processes, teacher is helps the student to understand, to discover. Then, Mr. Mu had demonstrated to students many artwork from modernism overseas with detailed explanation. He then demonstrated his own traditional Chinese painting, he also talked about where the inspiration originates, as well as amusing things associated with those work. Speaking with confidence, his talk flashed and received applause and the laughter unceasingly. The last part of the talk is question and answers, many students raised questions that they concernes. To address the question regarding East and West culture, Mr. Mu said that, we cannot follow or oppose the American culture completely blind, but must take its essence, picks out its dregs, our goal is to adopt the good things. Many showed their doubt to “overthrows the authority, overthrows master”, Mr. Mu stressed, overthrows the authority is not the superficial meaning of overthrowing, instead, we must study master, and surpass master, stands up and look farther ahead! The lecture was conclude at 6pm in entire audience's warm applause, the entire course lasted two and half hours, Professor Mu lectures rushes spiritedly with unceasing applause. The Jiageng lecture series is a academic lecture series, has held since March, 2006 and invited renown professors, including Professors Yi Zhongtian, Huang Benli, Qian Jiayu, Hong Huasheng, Wang Lingzhi, all well-known leading scientist of academics.